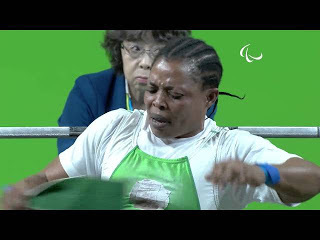 Esther Oyema has given Nigeria its third medal of the ongoing 2016 Paralympic Games in Rio on Saturday by winning a silver medal in the power-lifting competition. Oyema won the medal in the women’s -55 kg event of the competition after finishing second in the event. She won with a lift of 127 kg in the nine-athlete event. Her first attempt at 127 kg was a failed one, but she got it right in her second attempt, while her third attempt which was at 130 kg was also unsuccessful.